Hello! I write this post on a sunny Monday evening – a concept which is generally non-existent north of the border, so I’ll enjoy the good mood while it lasts. It’s been a while since I had a little chat on the blog. Things have been rather hectic recently (broken record, I know) but tonight I’m taking a break from endless scrolling on Twitter and doing something reasonably productive. I’m also in a pretty good mood, which helps the productivity! Tomorrow marks the start of the 10-day countdown until I go on holiday. I know that some people literally book up a year in advance, and I certainly didn’t, but it feels like ages since I was sat in the travel agents with my sister. Time has crept on me, however, and I’m running around like a headless chicken. I’m taking 2 clothing items to be altered tomorrow, I only picked up pyjamas yesterday, and I haven’t even looked into sorting my travel money yet. The important stuff (apart from the aforementioned money!) are all in hand – travel insurance was sorted ages ago, I’ve got my updated EHIC (let’s hold onto it while we can, guys) and my passport is sat on my desk, where it shall stay until the day we leave. I’m not risking taking it out with me before that! My sister travels abroad a lot more frequently than I do, so I’m relying on her to remember all the little daft things that I’ll forget about. I’m so excited to go to Tenerife. I’ve never been before – and it’s been literally 8 years since I’ve been on a proper holiday. I’m really looking forward to having some down time, and spending some quality time with my sister. We’re really close anyway, and we used to share a bedroom growing up, so this is gonna be just like old times. She can help me carry all my purchases from Sephora! I’m honestly making a pilgrimage to the north of the island to visit Sephora. It needs to happen. I have no idea how I’m getting there, but I’m sure the rep can help me out. Once they stop giving me funny looks. I’ve been feeling quite reflective recently, and I wanted to give you a little update on things that have been happening. I did a little post like this back in March if you want to check it out. I’m pleased to say that my mood has levelled out substantially since my last update in March. Of course, I have the odd day where I feel a little bit anxious about things, or I feel lethargic and want to sit and do nothing all day. But I think we all have days like that – they’re normal. There’s probably a couple of reasons for why things have improved so much recently, but I don’t think it’s appropriate to go into that. But I’m feeling much more myself – I feel much more confident in myself, my abilities, and my ambitions. Evy’s back – and she’s here to stay! Yeah, you read that right. I survived my third year of university, and can technically leave with an ordinary degree. At least, I’m pretty sure I can – still waiting on work to be marked, because why on earth would assignments be marked on time? I did a lot of to-ing and fro-ing in my own head about returning for Honours. I was absolutely certain that I wasn’t going to return. I hate university. So why am I going back? I’m going back to close a chapter. Everyone and their mother keeps telling me that an ordinary degree is worth nothing. In my opinion, an Honours degree is also worth nothing in this day and age, but whatever. It’s a benchmark. I’ll go. I’ll get the Honours degree. It’ll shut the world up. I don’t plan on using it. I haven’t learned anything. The field doesn’t give me the job security, nor the financial reward, that I’ll need to buy my own place. That’s all I want right now. My own little place in the world. A place that is mine. So we’ll see what happens. If I’m still in one piece by the time I hand in my Creative Research Project, we’ll revisit that conversation. I know I can do it. I just don’t particularly want to. I couldn’t give you an update and not post the photo, could I? This is the first full-band shot I’ve taken with the boys in 4 years. The meet and greet this time was literally a photo op with an autograph at the same time, which was a little disappointing. That being said, I’m still grateful to The Hustler Club for making these things happen. The show was great – I was gutted that Pierce The Veil had to pull out as direct support, but playing the album So Wrong, It’s Right in full definitely made up for it. 2 meet and greets in one blog post, don’t I look like the biggest fangirl on the planet?! It was so coincidental that I met All Time Low and Dan and Phil for the first time in 2014, and then almost 4 years to the day in both cases, I met them again. I’m thinking the stars are aligning, I don’t know about you! This was my fourth time meeting the guys – again, it was pretty quick, but they are so lovely and friendly. 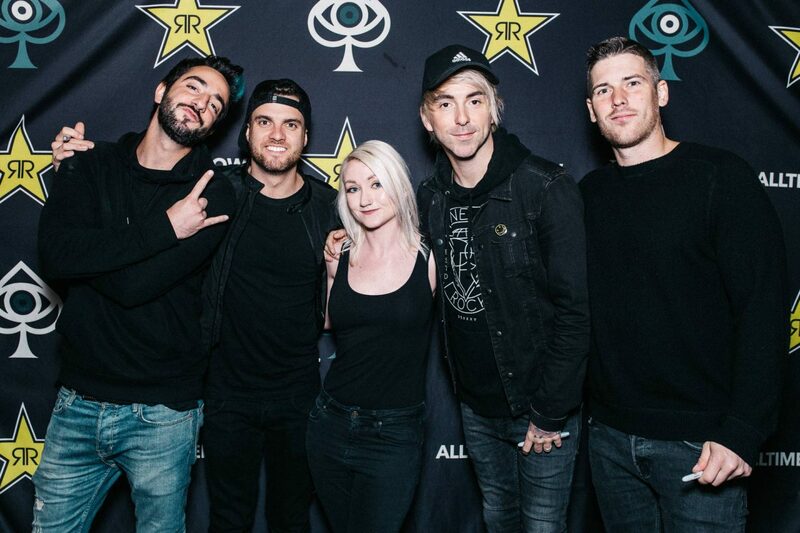 I don’t think I’ve ever prayed so hard for a decent photo in my life – the last time I met the guys, the person taking the photo on my camera blurred the photo in epic fashion – and the time before that, the flashback makes us all look horrendous! But I’m SO happy with this photo – the glo up on all fronts is definitely clear! 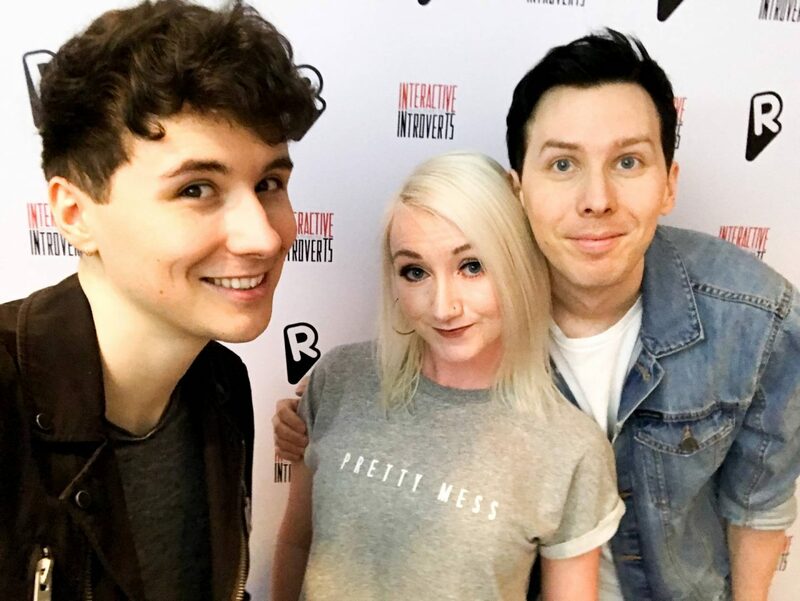 The Interactive Introverts show was brilliant from start to finish – I was crying with laughter throughout. Try and pick up a ticket if you can – not gonna lie, I was seriously tempted to see the show in Edinburgh as well as Glasgow. I really can’t sit still, can I? I’ve been volunteering with HBS for over 18 months now – I started presenting the Open Line request show on a Wednesday evening just over a year ago, and since then I’ve become more invested in the running of the organisation. At the AGM in April, I decided to stand as a committee member – and I was successful. As part of my responsibilities, I’m taking over the management of the website and social media – which I’m really excited to revamp! I’ve also started working on a new show – it’s called An Hour Of Girl Power, and features music from female artists and groups. I’ve been having great fun putting the shows together, and I’ll post more info once they’re being broadcast. It’s great being in charge of the music for a change – usually, I play what other people want! "My Top 5 Highlight Products"